WWF Bhutan and the Royal Society for the Protection of Nature (RSPN) have introduced Asia’s biggest wildlife quiz, Wild Wisdom Quiz (WWQ), in Bhutan. 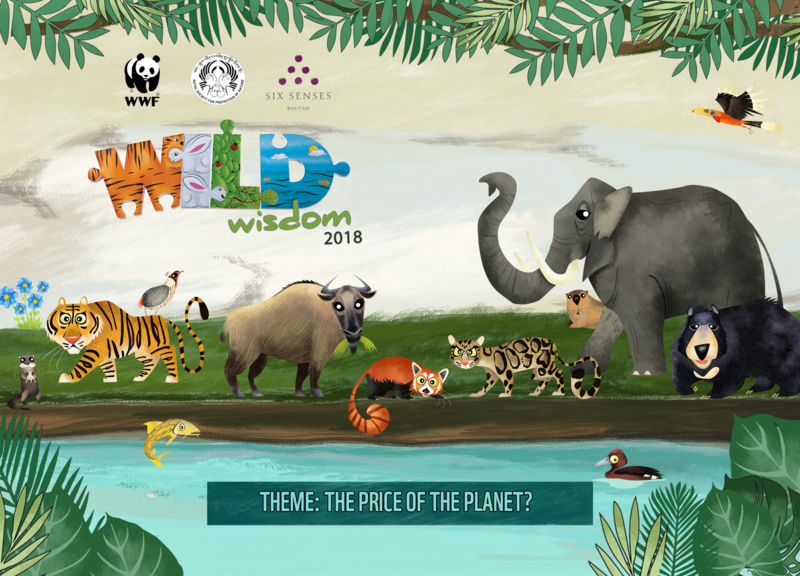 SEPTEMBER 11TH2018: WWF Bhutan and the Royal Society for the Protection of Nature (RSPN) have introduced Asia’s biggest wildlife quiz, Wild Wisdom Quiz (WWQ), in Bhutan. WWQ is a program created by WWF-India as a platform to reach out to young school children and promote their understanding of the value of biodiversity through a fun-filled and interactive learning experience. Now in its 11thyear, WWQ has seen the participation of more that 50,000 students in 800 schools in India and Nepal. 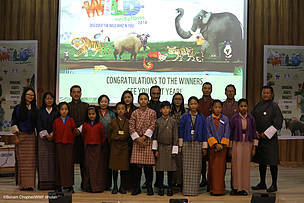 “Being the only international conservation organization in Bhutan, WWF Bhutan is committed to elevate the environmental consciousness of our young citizens. 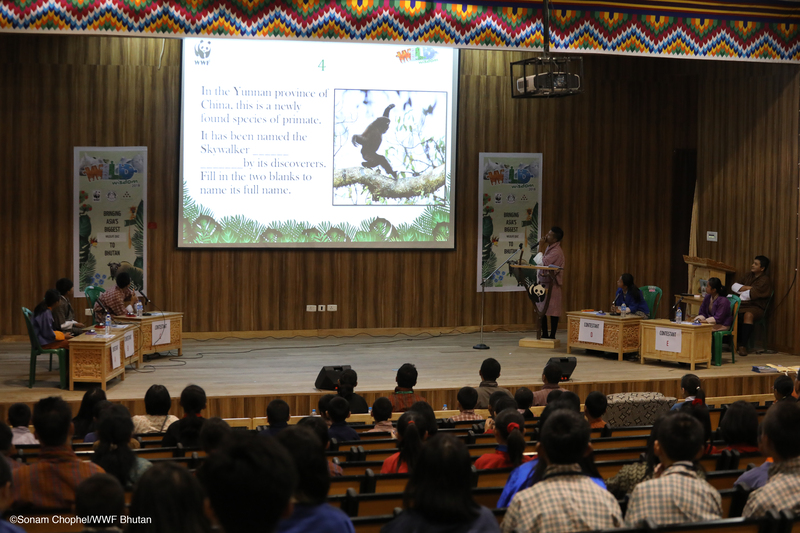 WWQ is a fantastic platform to reach out to young minds and promote the value of biodiversity and thereby inspire them to care for conservation because of its fun and interactive format,” said Sonam Yangchen, Communications Officer of WWF Bhutan. In Bhutan, WWQ was carried out in 15 schools in Thimphu through two phases. In the first phase, individual schools administered a school-level quiz for primary level students (class 3 to 5) and/or middle secondary level students (class 6 to 8) to select the top 2 scoring students from each level to participate in the second phase, a General-level quiz. 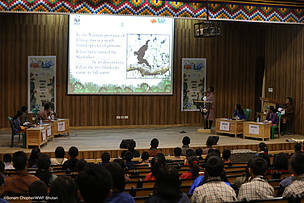 The general level quiz was organised by WWF Bhutan and RSPN at the Royal University of Bhutan. Six Senses Bhutan, an upcoming luxury resort that focusses on sustainable practices partnered to sponsor the prizes. Winners from the middle secondary level at the national-level quiz, Kuenga Palmo (Class 6, Changzamtog Middle Secondary School) and Rigden Kuenga (Class 6, Etho Metho Primary School) will be representing Bhutan to complete in the grand finale in New Delhi, India in October which will be hosted by the pioneer of Indian quizzing, Mr. Siddhartha Basu. Top five students from middle category participating in the stage level quiz. Winners of he Primary and Middle Secondary level quiz. 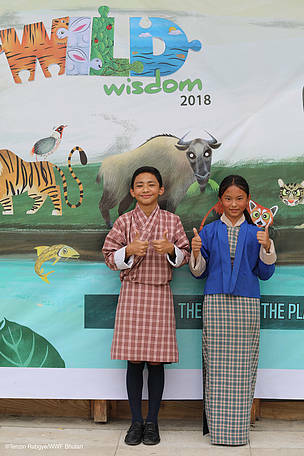 Rigden Kuenga 2nd & Kuenga Palmo 1st will represent Bhutan in the Wild Wisdom Quiz in New Delhi in October 2018.